This week after the news, we speak with Laurie Gerber, Board member of the Association for Machine Translation in the Americas, who tells us about an upcoming Machine Translation conference. Then, we’re joined in the studio by Rob Farrow to discuss social networks, online identity, OpenID, and Chi.mp. This week’s song pick is inspired by Chi.mp: “Code Monkey” by Jonathan Coulton. A team of astronomers has identified the least luminous galaxy known, but found it is surprisingly massive. Using the Keck Observatories up on Mauna Kea, Marla Geha, an assistant professor of astronomy at Yale University along with her colleague Josh Simon at the California Institute of Technology, has observed about half of the two dozen dwarf satellite galaxies that orbit the Milky Way. At the University of Hawaii, chemists traded their lab coats for surf shorts, breaking out of the lab to test their theories on the waves. UH chemistry professor Robert Liu and his colleagues found that local surf spots provided ideal conditions to study photochemical reactions, and by building a special boogie board with a test-tube mounted in it, they were able to use the sun’s rays to make variants of vitamin A.
Dana Slaymaker of Resource Mapping Hawaii developed a camera system that can map thousands of acres by airplane with images so detailed that tree leaves can be identified. The development of this technology is expected to revolutionize conservation work in Hawaii and around the world. Increasing demand and a changing climate have led to the collapse of several once-rich fisheries around the world, and many are still in danger. Regional overfishing can lead to extinctions of native fish species, and in the long term, huge shortfalls in the food supply for millions. Around the world, policymakers, environmentalists, and fishermen have been searching for a solution. And a university of Hawaii economist — along with colleagues at the University of California at Santa Barbara — say one controversial solution may have merit. This week in the studio, we speak with Sid Savara who’s helping to organize “Startup In A Weekend.” Then, we discuss online health care with Fred Fortin, Senior Vice President who oversees strategic policy development, legal affairs, privacy and security at Hawaii Medical Service Association, Ido Schoenberg, Chief Executive Officer of American Well, and Nate McLemore, Senior Director of Microsoft’s Health Solutions Group, talks about Microsoft Health Vault. At an IEEE meeting last week at the Hilton Waikaloa on the Big Island of Hawaii, the Very High Throughput study group put the final touches to a proposal calling for the creation of a task group to carry forward the work of crafting a new Giga Bit wireless LAN standard. A University of Hawaii physics professor has suggested that aliens could be sending signals by tweaking the brightness of stars. Professor John G. Learned proposed in the latest issue of New Scientist that “a sufficiently advanced civilization” may use “Cepheid variable” stars as beacons to transmit information throughout the galaxy and beyond. The Hawaii State Department of Agriculture was recognized as one of the winners in the second annual RFID Excellence in Business Awards. TechInsights and RFID Revolution announced the winners at a formal ceremony on the opening day of the RFID World 2008 event at the MGM Grand in Las Vegas last week. The awards recognize companies and innovators whose products or implementations demonstrate the benefits of RFID or radio frequency identification technology. An Air Force crew has performed the first known after-dark landing in Antarctica using night vision goggles. The mission was part of Operation Deep Freeze, which is commanded by the U.S. Pacific Command’s “Joint Task Force Support Forces Antarctica” and headquartered at Hickam AFB. The massive plane landed in complete darkness, guided only by reflective cones seen through night-vision goggles, proving that the C-17 can access McMurdo Station, Antarctica during times of the year previously only flown for emergencies. This week in the studio, we speak with Roz Savage, who is on her way to becoming the first woman to row, solo, across the Pacific Ocean. 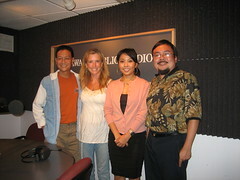 Then, Tiffany Tanaka of WeSellThings4U talks about building a business buying and selling on eBay for a living. She started with friends and family and grew the business to include individuals and corporations looking to sell goods on eBay. State tech tax credits increase 43 percent: The economy in Hawaii and across the country is slowing, with prices rising and visitor numbers falling. 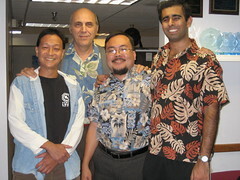 But Hawaii’s technology industry is showing encouraging signs of growth. According to a state report release last week, local high tech companies received over $300 million from investors last year, while the total amount of tax breaks they claimed hit $100 million in 2006. Hoku unit inks supply deal with Chinese company: Hawaii-based Hoku Scientific Inc. said late Thursday one of its units has signed a 10-year contract worth up to $455 million to supply polysilicon to a Chinese company. Hoku Materials Inc., which makes and sells polysilicon for the solar market, inked the deal with Solargiga Energy Holdings Ltd.
IfA Maui to Hold Open House September 12: On Maui, the University of Hawaii’s Institute for Astronomy is celebrating it’s first birthday. The IFA will be holding an open house this Friday at the Maikalani Advanced Technology Research Center in Pukalani. The family-friendly event will include laboratory tours, demonstrations, stargazing through telescopes and talks about the latest astronomical discoveries from atop Haleakala and in astronomy research on Maui. Our song pick of the week, courtesy the Podsafe Music Network, is “Bei eBay” by Ricky Ganz Allein. This week, we speak with Joel Paschal and Dr. Marcus Eriksen, who voyaged across the Pacific to Hawaii aboard the “JUNK raft. 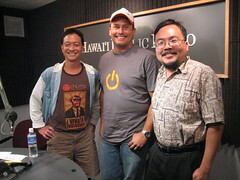 Then we discuss podcasting with Roxanne Darling and Todd Cochrane and talk to them about the upcoming PodCampHawaii. Honolulu Declaration Offers Ways to Curb Ocean Acidification: As the oceans absorb increasing amounts of the greenhouse gas carbon dioxide, they are becoming increasingly acid, weakening the world’s coral reefs. Scientists aim to combat ocean acidification via limits on fossil fuel emissions, reduction of stress on reefs, and creation of marine protected areas. Magmatically Triggered Slow Earthquake Discovered At Kilauea Volcano, Hawaii: Slow earthquakes are a special type of earthquake where fault rupture occurs too slowly (over periods of days to months) to produce any felt shaking. Slow earthquakes of magnitude 5.5-5.7 have been previously found to periodically occur on the flanks of Kilauea. Hawaii’s Conversion of Coal Plant to Biomass Marks a New Trend: A coal-fired power plant in Pepeekeo, Hawaii, that formerly provided electricity to a sugar mill is now being converted into a 24-megawatt (MW) biomass power plant. MMA Renewable Ventures is financing the conversion and will operate the new plant, which will be called the Hū Honua Bioenergy Facility.